I was two years old when my mother, sensing a bonny baby show opportunity at the local town fair, harnessed my pudgy wriggling body into a neon frilly dress replete with frilly bonnet, frilly bloomers, frilly socks and co-ordinating frilly hairband. Did I mention they were frilly? Lest there be any gender confusion, it was, of course, a shade of pink. This was the 80s. Girls wore pink dresses and boys blue romper suits! No discussion. My mother swears I spent the whole day twirling and curtseying, mesmerised by her sartorial choices. Thankfully at the age of 35 I’ve left the bonnet and bloomers behind me but that day instilled a love in me for this type of attire. I’m a divil for a dress. Perhaps that’s why the search for ‘THE’ dress to beat all dresses was destined to be fraught. Like all things wedding related, my initial move was the wrong one, a google search with the words ‘incredible awe-inspiring flattering one-off never seen before completely original wedding dress limited budget’. Two weeks, four shops and 20 dresses later, I was a little confused. I wanted tulle, silk, lace, duchesse satin, strapless, off-the-shoulder, high-necked, low backed, straight cut, mermaid finish, princess style dress. In other words, I wanted everything. There’s such beautiful dresses out there but I finally settled on one. One designer that is. In my heart of hearts I knew if I was ever to replicate the joy of the neon pink frilly number, I’d want input in the dress design. As soon as I met Orlaith Carroll, I felt confident that she was the one to take on the challenge. Based in The Attic Boutique in Limerick, Orlaith Carroll is a name to watch. 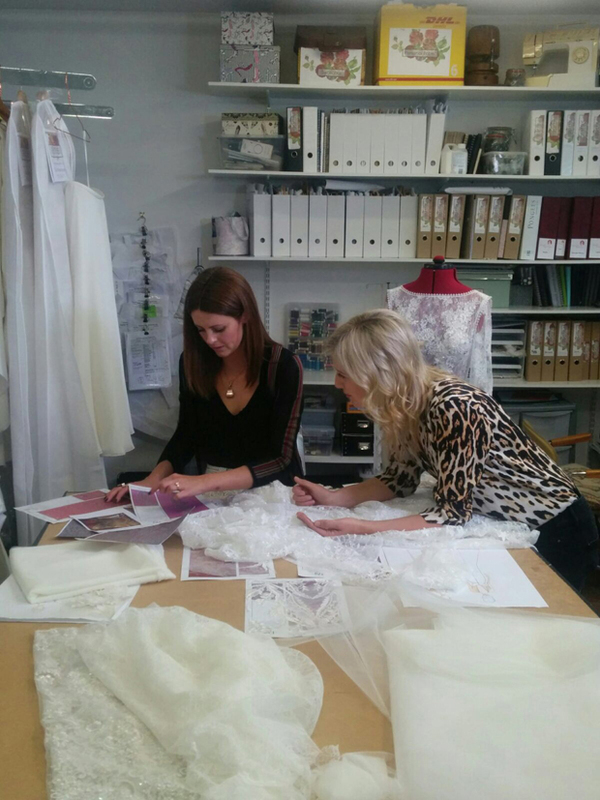 Stocking the sensational Anna Georgina and Elbeth Gillis labels, Orlaith also designs and makes bespoke dresses working closely with brides-to-be to deliver dream dresses. Last week I had my first fitting. To be honest I was nervous but I trust Orlaith. She’s as passionate about this dress as I am. 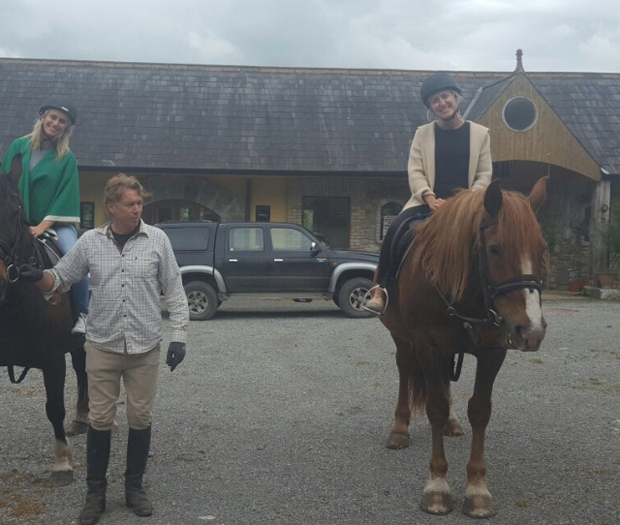 Having recently said ‘I do’ to her own Mr Right, Orlaith understands how important this is to all brides-to-be. Over the next eight weeks, she’ll work night and day to move the dress from the mock up I saw this week to the finished product. I can’t tell you much now but I’ll show you a picture at a later date I promise! I can give you one clue. It’s not pink. Amidst all the wedding planning which I’ve found a little stressful if I was truthful, there was some much needed fun. And really ladies is there anything more fun than a hen party? Giggly girls, tick. The pop of prosecco corks, tick. An invasion of inflatable… ahem! I thought I would find all the attention a little overwhelming. How wrong I was. My family and I are huge Michael Jackson fans so when I read that Bishopstown House, the place Michael spent time in while in Ireland, was available to rent for hen parties I screamed a massive ‘Shamon’! Organised by my sisters Laura and Kelda and my bestie Julie, I had the best three days fun of my life. 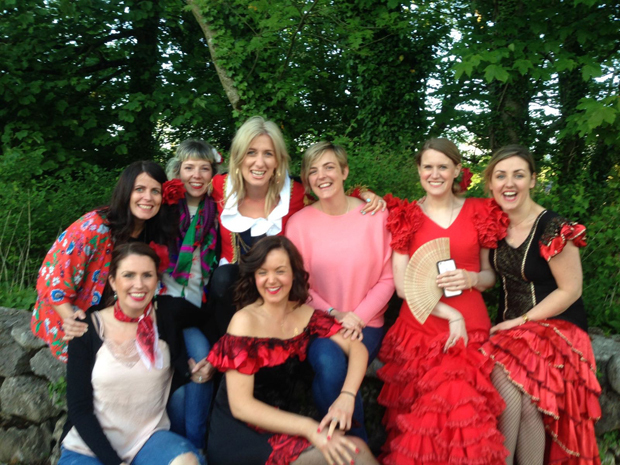 Spanish themed, I became a proper henorita drinking sangria, wearing sombreros and embracing my inner matador. Surrounded by my closest family and my oldest friends, it’s a weekend I’ll never forget. I think I sang once (Johnny Logan, Hold Me Now), I’m pretty sure I cried twice (my mother and aunts dressed in full Abba rig-out singing Dancing Queen tipped me over the edge) but I know I laughed more in that 48 hours than I ever have. I just wish I could do it all over again!! Laura, Kelda and Julie… you don’t have any plans this weekend, do you? 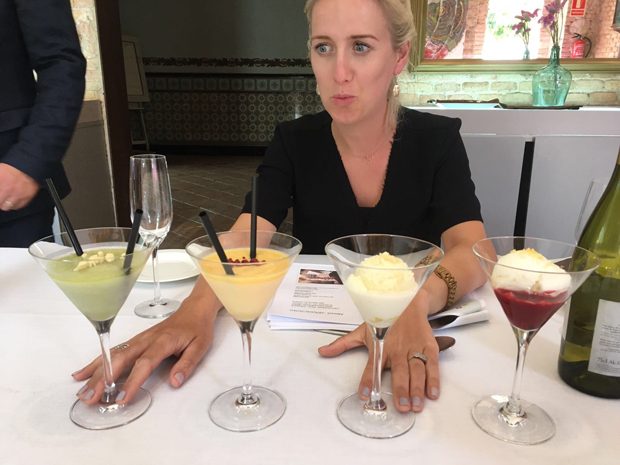 Thankfully the fun continued when Richard, my fiancé, and I spent three days in Barcelona choosing our wedding food and drink. No one told me this would be so much fun. For five hours we sat sampling tasty tapas, gorgeous gambas, incredible iberian ham and crisp clean cava. Despite the protests from the catering company that every morsel didn’t require sampling, I indulged in it all. Food is a real focal point in Spanish weddings so I hope our guests enjoy it as much as we did. After all the excess I had to start ‘body’ prep and recently began training with Robbie Atkinson from Total Training Dublin. I’ve been attending Pilates and the odd Boxercise class since November but I wasn’t committed – Robbie’s changing that. He’s pulled me off the comfort of the cross-trainer and pushed me into the scarier part of the gym. The weights zone. I’m deadlifting, bicep curling and shoulder pressing on a weekly basis mixing Boxercise classes with short bouts of cardio and long periods of split squats, plank holding and bear crawling. I think* (read hope) it’s making a difference. Robbie has become part personal trainer/therapist and I’d go as far as saying, I enjoy our sessions. He promises I’ll be a lean machine by August 24th. I know he’s up for the challenge – the question is, am I? But back to the actual wedding planning. As the wedding was a) abroad b) set for August 24th 2017, I knew I’d need help. 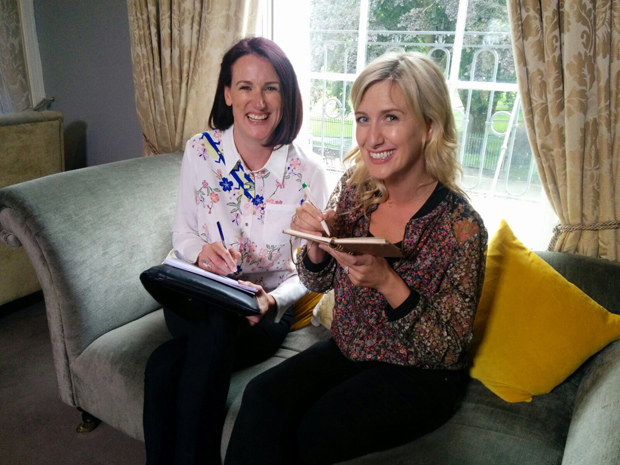 My research on weddingsonline.ie led me to our wedding planner extraordinaire Sharon Mc Meel. Winner of Wedding Planner of the Year at the weddingsonline Awards in 2016 and 2015, there could be no one else for the job. Sharon has been invaluable and has ensured that Richard and I stay on track and in budget. Neither of which is easy. We meet on an almost weekly basis and she’s advised on everything from flowers to photographers, invites to music, bridesmaids to wedding dresses. When you’re planning a wedding, you’re aware of the major things but it’s the details that can slip you up and they add up quickly. Transport, table and chair hire, PA systems – all essential back-end stuff that you take for granted but has to be sorted. The big difference a wedding planner makes is that the worry of missing something or forgetting something important is gone. Instead we can march forward ticking off everything one-by-one and zeroing in on the day itself. The big job at the moment is trying to style the venue. It’s a beautiful casa up in the mountains outside of Barcelona but as we’re having the bash outside, there’s a lot of areas to dress, style and spruce up for a party. We have a very small budget to stretch across three or four key areas: ceremony area, reception terrace, dinner terrace and dance floor. So we have to use it wisely. Sharon will be doing a recce to take a first-hand look at what we’re planning and she’ll come up with some creative solutions. I’m sure there’ll be compromises but when you’re organising something like this, you’ve got to be adaptable and when problems come up, it’s all about finding quick and simple solutions. That’s Sharon’s gift! One thing we have nailed down is our photographer. I had a laissez-faire attitude to wedding photographers, I mean how difficult can it be to pick a photographer? Not for the first time I was wrong wrong. Arty. Indy. Vintage. Constructed. Natural. Celebrity. Researching a photographer was like standing in front of a magazine rack. The choice was daunting. Chatting it through with Rich, a couple of requirements were important for us when it came to picking a wedding photographer. We wanted someone very personable and relaxed. There is nothing worse than a bossy wedding photographer! We wanted someone who wouldn’t take us away from the party but who could capture moments as they happened rather than posing for set-up shots. Plus we wanted the camera on our guests as much as us. We want to have memories not just of how we’re looking on the day but also of who was there, who was mingling with who and capture our friends and families with big smiles on their faces. Step forward Dermot Culhane. A few friends in the business had mentioned Dermot to me and he came highly recommended. He was also Wedding Photographer of the Year 2016 so I called him up for a chat and he agreed to meet me. Within two minutes of discussing his approach, I knew he was the guy. His job on the day is to mingle with everyone, keep a discreet distance and capture the spontaneity of the day as a wedding guest. To be safe, he asked for 15 minutes after the wedding ceremony with just the two of us for some couple shots but no more. A fact Rich was mightily relieved about! Who wants to spend hours with a photographer when your wedding party is kicking off behind you. Dermot is a gent, really professional and very personable. It’s a reassuring feeling knowing we can focus on having a great day while he’s focusing on the perfect snap without treating it like he’s directing a shoot. That’s all for this instalment folks – see you next month. 8 weeks to go! Ciara Doherty has worked in radio and television for over a decade and is best known as a presenter on the very popular TV3's Ireland AM. Ciara got engaged to her beau Richard on New Year's Eve 2015 and blogged all about the lead up to her Spanish wedding in August 2017.